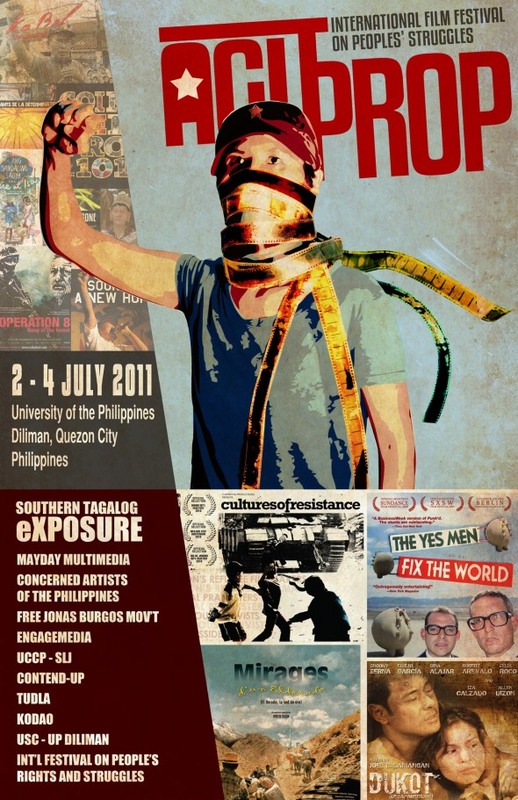 AGITPROP is an international festival of films that promote genuine peoples' struggles all over the world. It takes the role of giving a much needed venue for films and filmmakers that dare present social realities, often silenced and confused by the dominant modes and channels of information. It is for films that take on the issue of imperialism and neoliberal globalization, liberation struggles, genuine democracy, human rights, and social justice among others. The name of the festival takes its inspiration from the educational/cultural campaign in the Soviet Union during the 1920s after the October Revolution, when films took the role of arousing and educating the masses. The 1st AGITPROP Film Festival was held on July 2-4, 2011 at the University of the Philippines (Diliman, Quezon City). It was being organized alongside two international events to be held also on the same month here in the country - the International Festival of People’s Rights and Struggles (IFPRS) and the 4th International Assembly of the International League of Peoples' Struggle (ILPS). The ILPS is an international organization promoting freedom and democracy which at present includes more than 350 member organizations from over 40 countries. The IFPRS, on the other hand, is an initiative of ILPS member organizations to give venue for the exchanges between sectoral groups around the world on issues of human rights, livelihood, welfare, women’s rights, arts and culture, and social justice, among others. Both events seek to forge a stronger and broader solidarity among organizations and individuals in the struggle to advance and defend the peoples' genuine democratic rights and aspirations throughout the world.